Coffee is a basic part of most people's daily morning routine. It is universal in nature and there's no surprise that it evokes strong feelings of fondness from the familiar spring it brings. These attitudes are summed up easily on a t-shirt, so you can say your piece without having to even open your mouth. We've sorted through the many options available out there and have organized them by ladies and gentlemen (for fit purposes) but by all means get the one that speaks to you regardless of category. Many come in a large assortment of colors, styles, and materials. There's bound to be the right one for your specific sentiments. These are exquisite as a gift for those on your list who need to share it with the rest of this coffee obsessed culture. 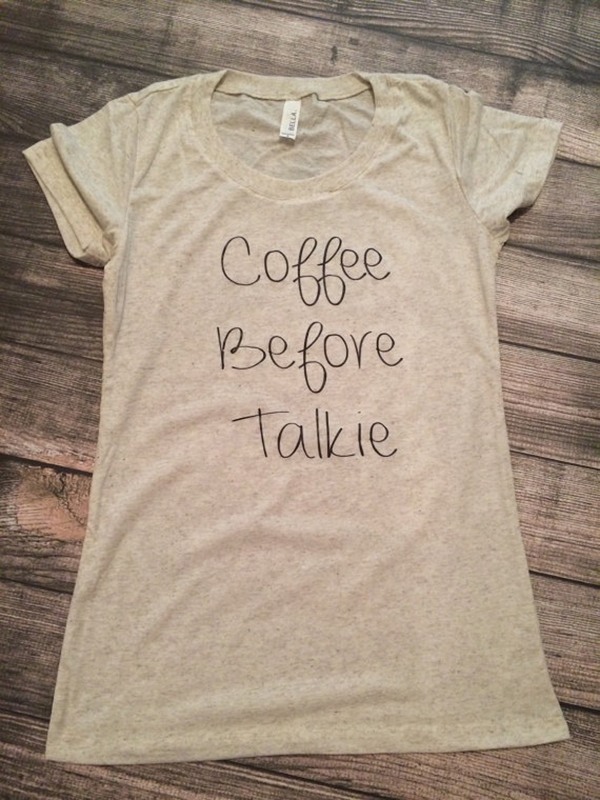 Let everyone know that you can't be bothered for conversation until you've re-upped your coffee intake. This oatmeal in color, cotton/rayon/poly-blend t-shirt is made to be your instant comfy morning garb. Now you won't have to apologize when you refuse to engage in cheery morning chats before you've had your first cup of the day. 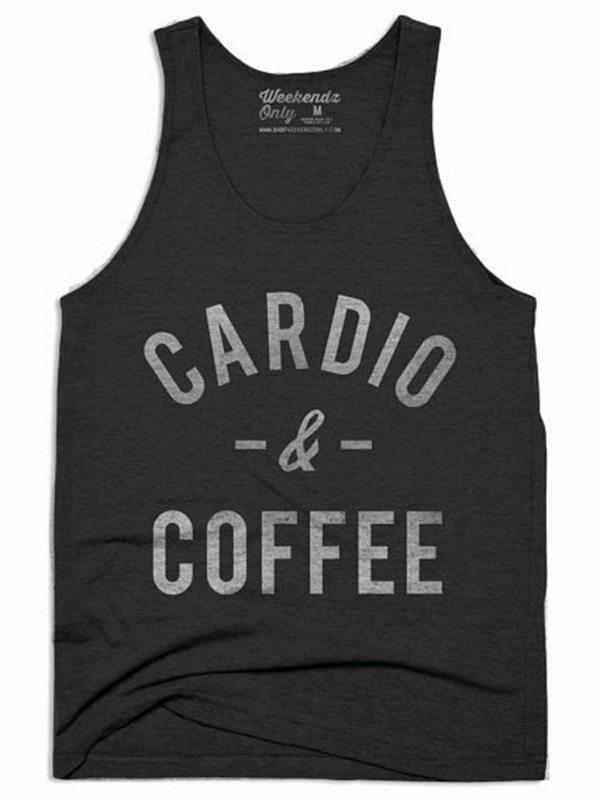 When your fitness routine comes close to your need for caffeinated fuel to get going, this tank's for you. Made for weekend lounging or for your daily AM power cycle fitness class, this sleeveless tank is vintage black and will fade over time for an even more worn-in appeal. Show off your guns and enjoy that large iced coffee while you're at it. 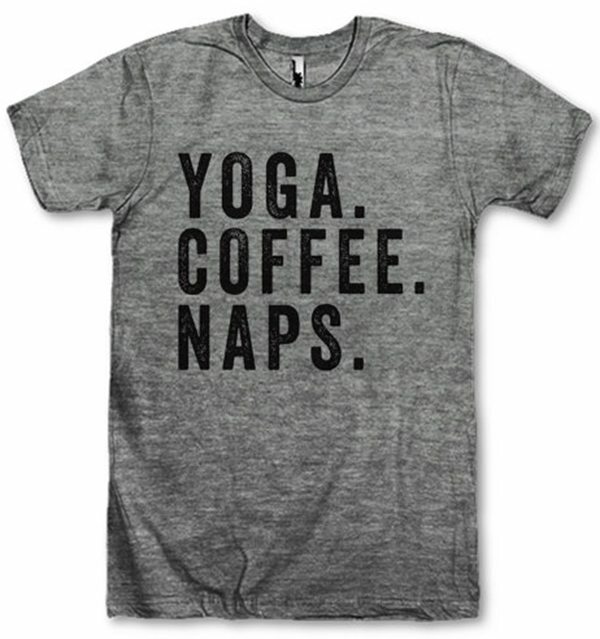 If you aren't for the cardio bit, but love the relaxing bookends of yoga and naps with your energy boosting coffee, this shirt will fit into permanent rotation in your lounge wear collection. Printed on an American Apparel tri-blend classic fit t-shirt that was designed for that flawless classic rugged feel. These run a bit large, so if you want a snug fit, order a size down. You love this seasonal treat more than anything else fall has to offer. 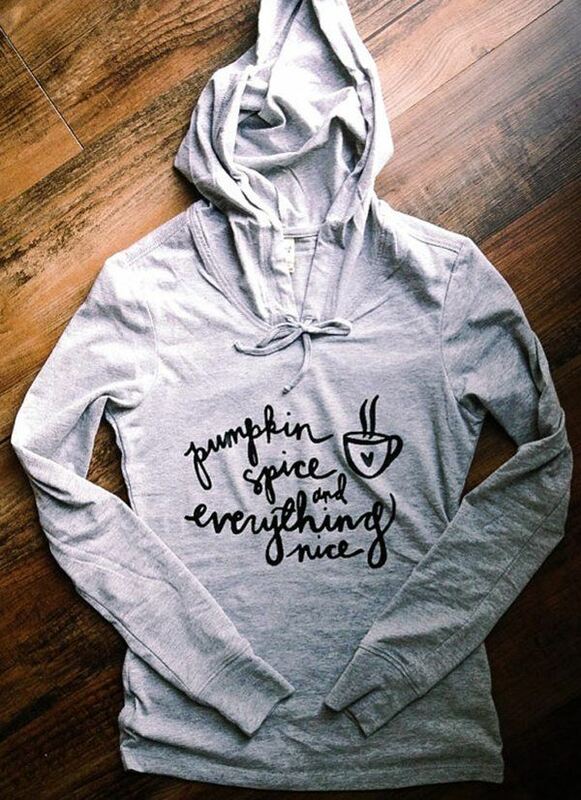 If you believe in pumpkin spice magic, why not bundle up in a delicate grey hoodie that shows your allegiance of autumnal spices, pumpkin flavor, and latte goodness. This thin, made-for-layering basic will surely be a staple in your fall wardrobe. 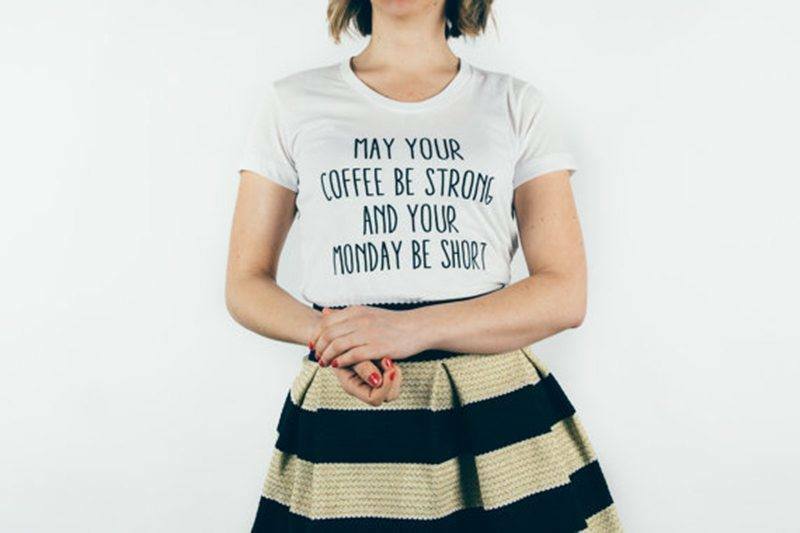 For those stuck in the 9-5 routine, this white t-shirt with black lettering will help you and your co-workers make it through by sharing in this new dictum. Although it is a casual t-shirt, you could definitely glam it up as shown in the listing, with a sharp skirt and heels. These t's are pre-washed from American Apparel, so there's no need to adjust sizing for shrinkage. 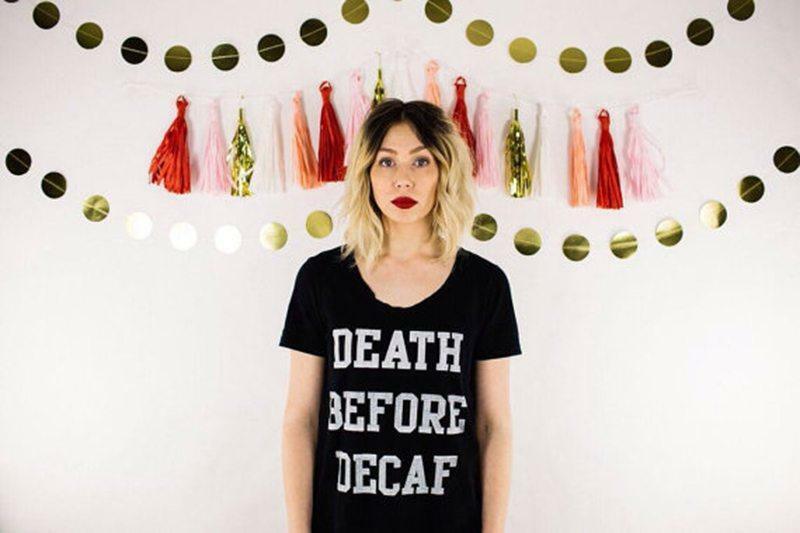 Decaf-lovers, beware. 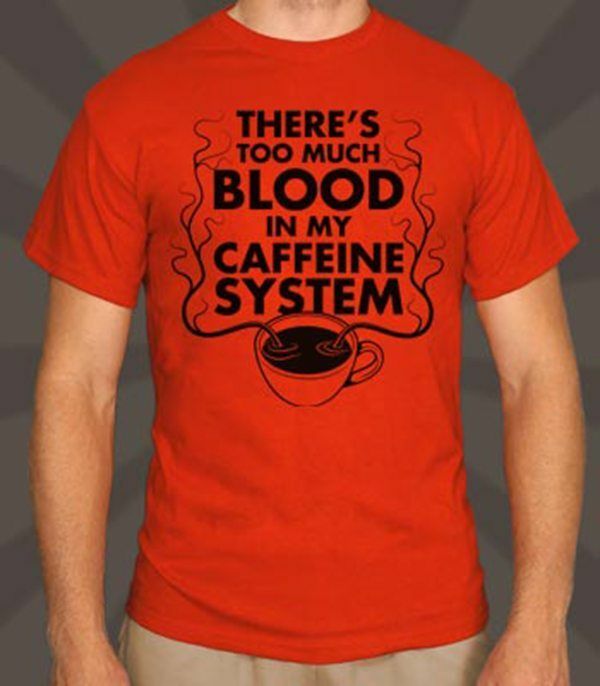 This shirt is not for you, although I'm not sure why decaf coffee gets so much hatred. Coffee does have more to offer (taste!) than just caffeine. However, there is something missing when you aren't having the real thing, it just tastes different, right? 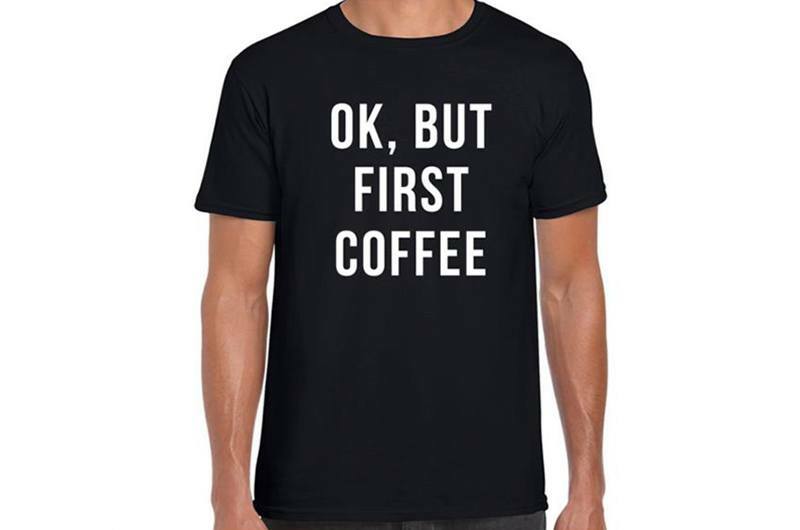 Regardless of your favorite kind of coffee, share your devotion to the real, full-strength java with this shirt. 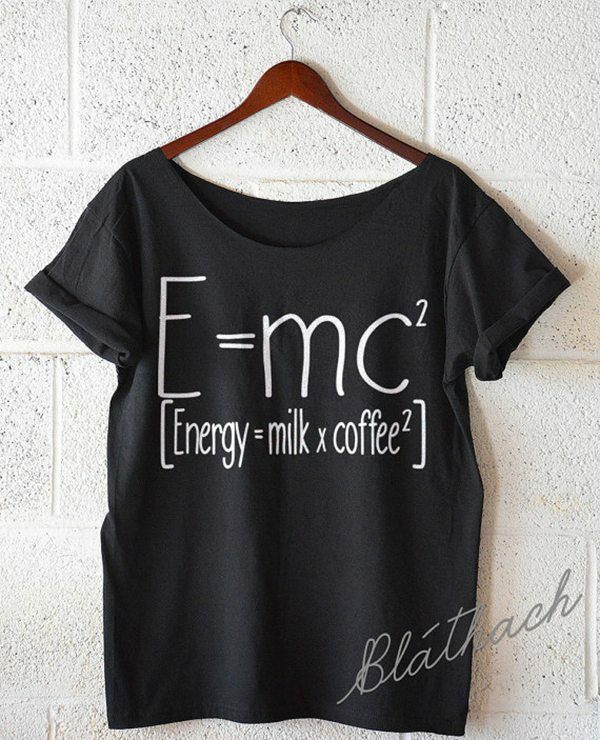 A more accessible take on Albert Einstein's famous relativity equation, where energy is derived from milk and coffee squared is the focus of this cute t-shirt. It is a loose fitting, off the shoulder top, featuring a raw cut edge on the neckline and rolled sleeves for that vintage grunge feel. Excellent for wearing while brushing up on your physics. 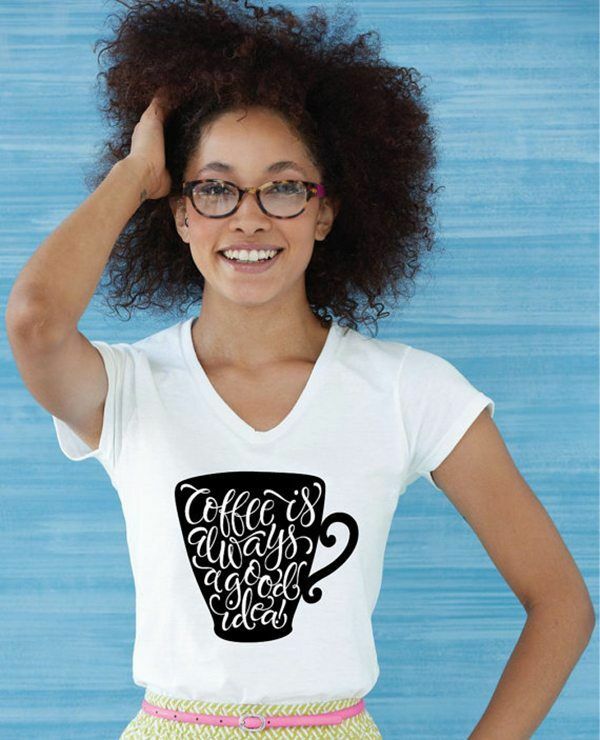 Customize the color of the mug that contains the phrase “coffee is always a good idea” in loopy cursive for an excellent gift for a friend who loves the stuff or as a treat for yourself. This v-neck white short sleeved shirt is pre-shrunk jersey knit for an easy, cushy feel. You may need a bit of a boost to get going with your daily to do list of tasks, and this shirt says it with some degree of subtlety. Let your co-workers or friends know that you are down for whatever, as long as you have coffee as a priority on that list. Settle into the comfort of this 3/4 sleeve terry raw edged sweatshirt. Choose from a host of custom colors (black, dark grey, neon pink, red, and white) and text finishes (glitter and metallic foil) to match your personality. What drives you? 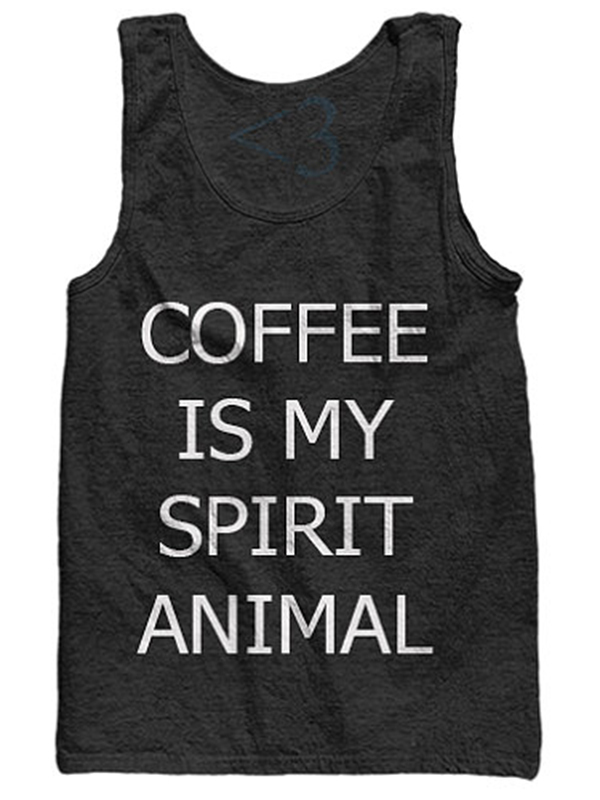 Ladies and guys alike can express their love of coffee with this unisex spiritual take on the beverage. Inspire others to get going by wearing this plush tank that comes in three colors (black, white, or grey). Made from supremely soft material and screen printed with a lightly aged text that tells everyone how you really feel about your favorite drink of choice. 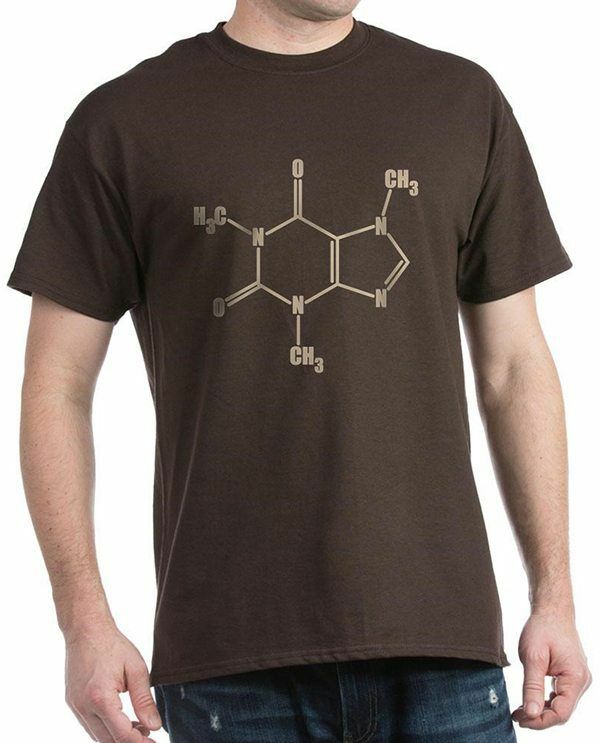 Coffee and science go hand in hand on this ingenious shirt that features the molecular structure for the energy inducing substance known as caffeine. Choose from a large selection of colors and shirt style including the classic loose fit long or short sleeved t-shirt, baseball jersey, or golf shirt. Enjoy this homage to the best part of your day. Crossfit fanatic? Check. Coffee drinker? You bet. This competitive shirt helps you keep your priorities at the forefront during your workout or rest day. This snug t-shirt is made out of a cotton/poly/spandex blend for a fit that moves with you. 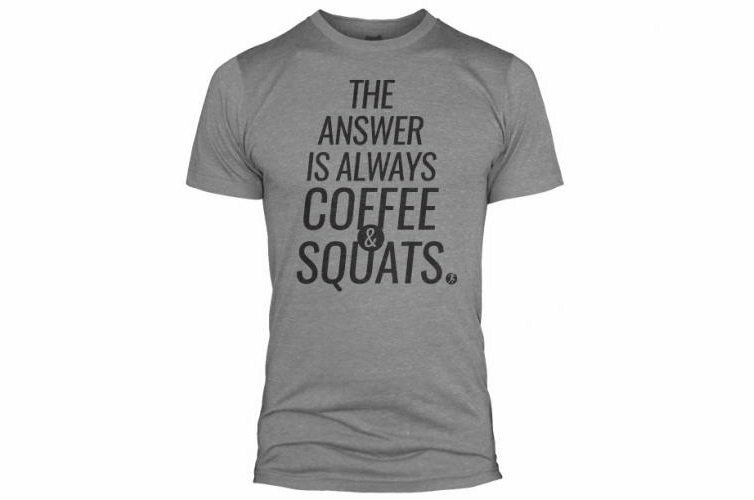 It comes in light grey with dark grey lettering and is just right for inspiring fitness and energy. 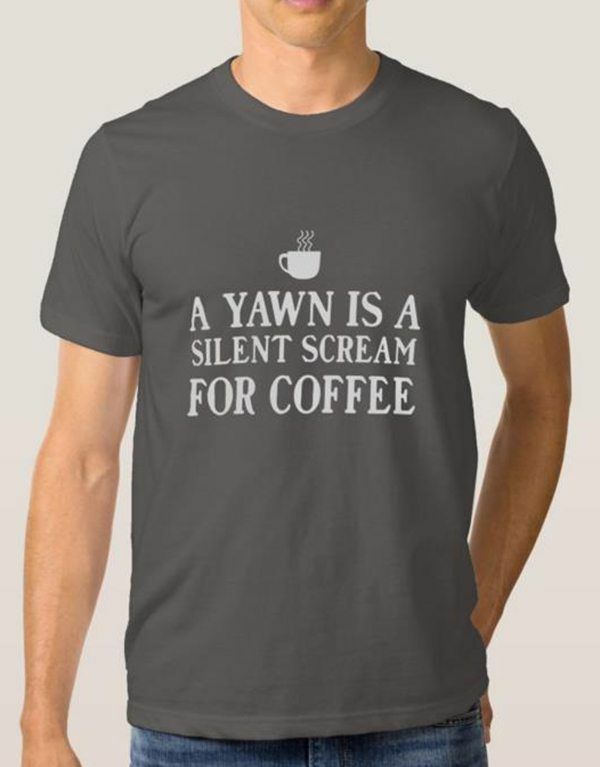 Giving new meaning to the common yawn, this shirt is sure to let everyone know how to remedy the low energy situation: with coffee. This philosophical musing on the yawn is sure to get some laughs and will hopefully get you that cup of coffee. Printed on an American Apparel smooth cotton jersey in a wide array of color choices and styles including women's styles, so you can get the shirt that's just right for you. Let the beachy vibe of this shirt take you from the coffee house to the seaside. 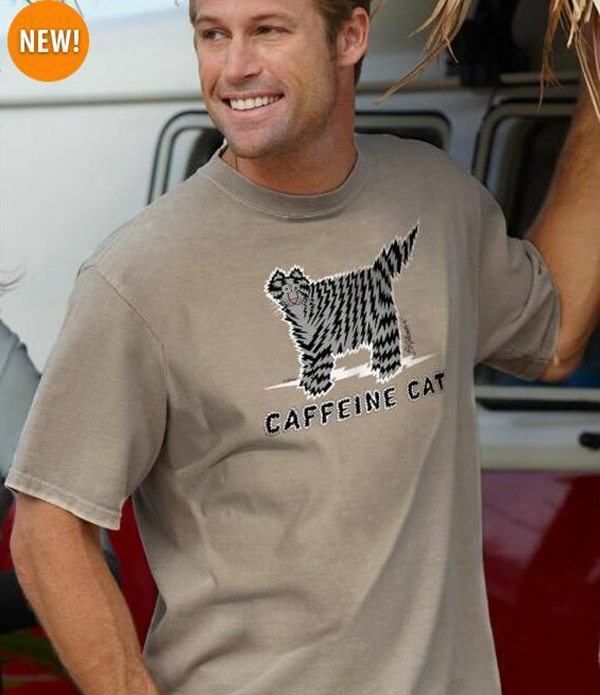 Featuring artwork of a black and white striped cat electrified by caffeine on a taupe colored pre-weathered cotton shirt, it is a unique way to pay tribute to the energizing effects coffee can create. If words don't express how you feel about the beverage, let the cat do the talking. This shirt has a reinforced collar made for durability as well as a seamless construction for a comfortable fit. The origin of this saying is foggy, but maybe that's why it seems a little disorganized and overly-caffeinated. It might be a twisted reference to the Smith's song “A Rush And A Push And The Land Is Ours,” but it's hard to say for sure. You can be certain that you've had enough coffee when you start to have a caffeine system going in place of your bloodstream. Choose from three colors (Red, Heather Grey, or White) for this cotton tee at a discounted price of $6. 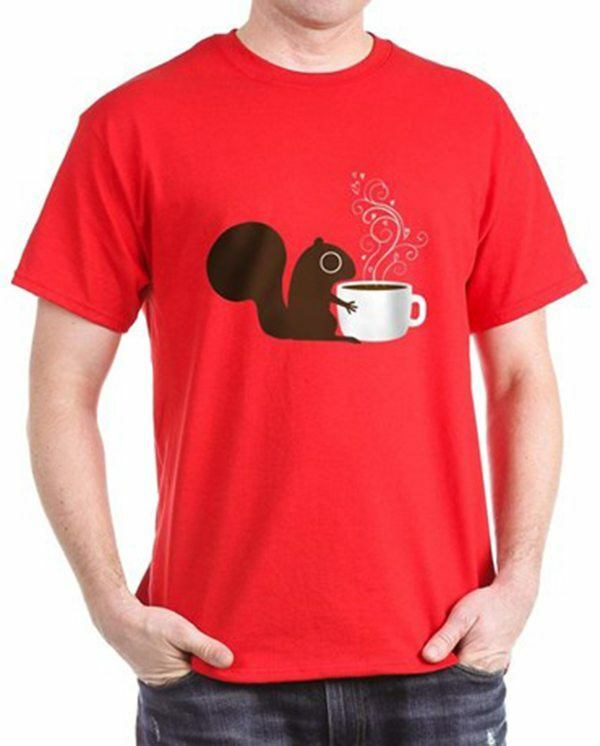 Show your coffee friendship with a whimsical squirrel holding an almost body sized cup of joe with magical swirls of steam. 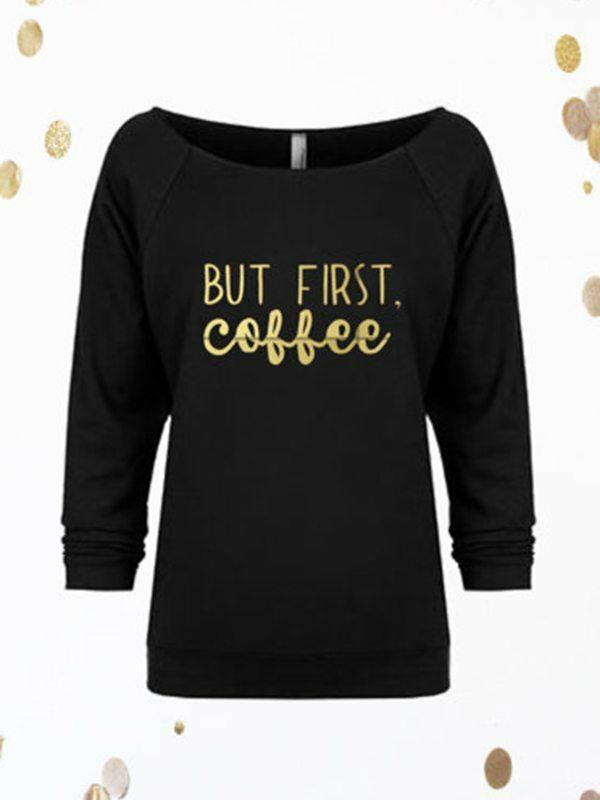 This shirt says all you need to say about how you feel when you are sipping that first delicious taste of morning coffee. Select your favorite color or style from the copious choices from this seller. 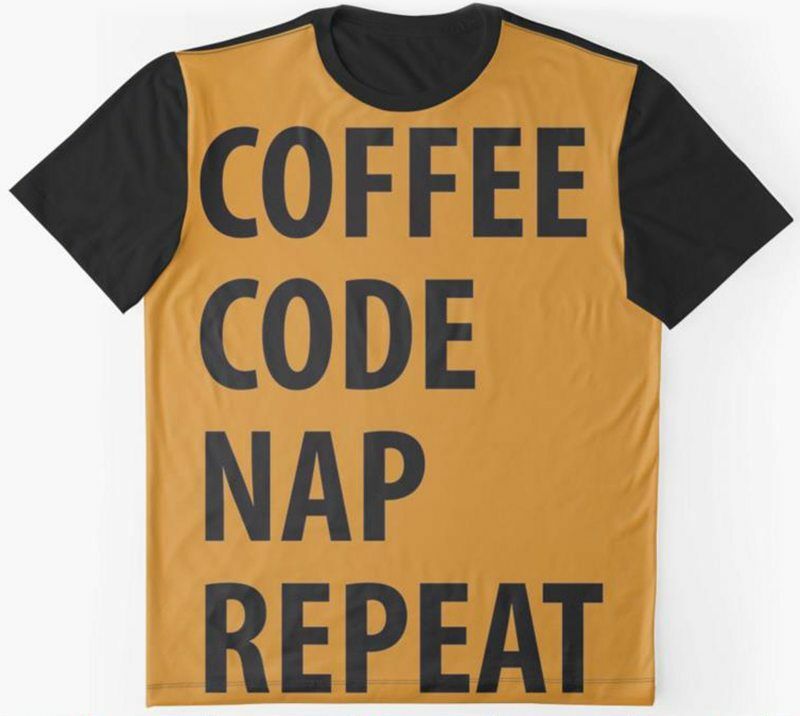 If coding is your profession, coffee and naps are a necessary part of the lifestyle loop. Many coffee shops are used to your laptop mobile desktop setup and this shirt says it all neatly in one place. Printed with the phrase in black on a gold background with black sleeves and shirt back, this blocked t-shirt helps you singularly identify your necessities. 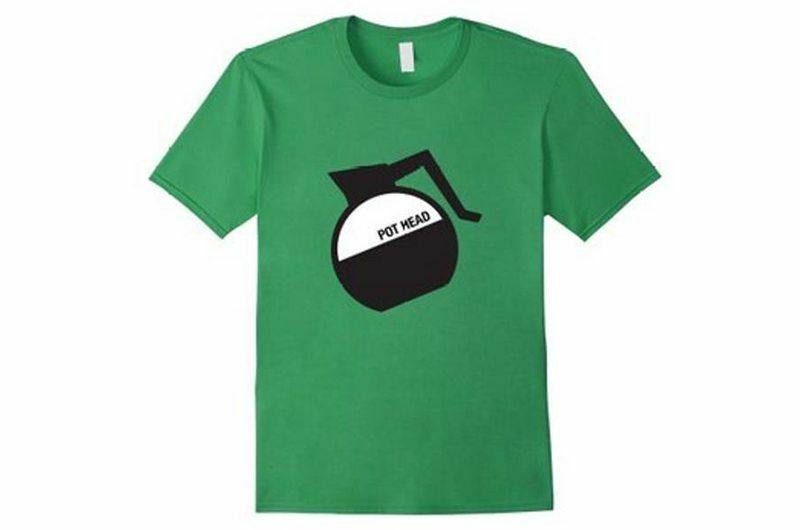 If you love old fashioned diner coffee with endless refills, share in the pun with this ‘pot head' t-shirt. Choose from five snappy colors (grass, lemon, royal blue, slate, or cranberry) and sizing for men, women, and youth for a perfect fit. It is made from 100 percent combed ringspun cotton and features an easy to tear away tag for comfort. Sure, you're able to get it done, but could we please put the important stuff first? Coffee helps you greet the day and get what needs to be done completed. Select from the all black and white color options with or without cupid style crossed arrows for that extra something. These shirts are also available for women in a tee or tank fashion. Searching the galaxy for the right coffee appreciation shirt? 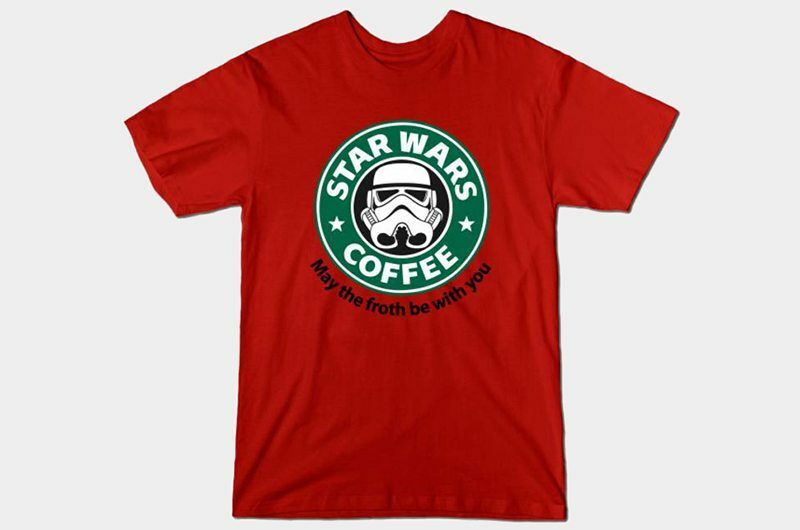 You've found it in this Starbucks styled storm trooper bedecked Star Wars coffee logo. Choose from a classic t-shirt, tank, sweatshirt, hoodie, or baseball jersey for the right addition to your wardrobe. Handpick your favorite color of this comfy tri-blend tee and remember to invoke the force froth next time you grab a cup.